Want to learn more about Team MGR check out the video and pictures below. Team MGR was started by a few friends with a passion for all things motorized. This passion spawned the need for an organized "team". The original name chosen for the group was Mechanical God Racing later shortened to MGR. Team MGR Racing would then go on to participate or race in as many diverse events as possible, just to see if we could complete the event or race. Our goal is to always finish what ever we started. We may never win the race but you can bet we will have the biggest grins on our faced when we are done. 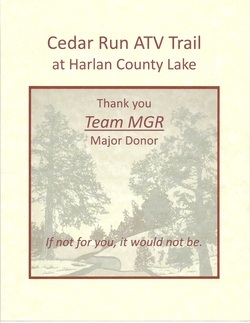 Team MGR also donates money and time to the betterment and education to the OHV (Off Highway Vehicles) community. Team MGR also does some unique events such as the Bolder Boulder, check out the page for details and formation about Team MGR's other endeavors. Team MGR has also hosted a few events over the years. One of the biggest achievements was helping with the organisation of the grand opening of the Cedar Run OHV trail and park near the Harlan County Lake in Republican City Nebraska. Team MGR put on a motorized scavenger hunt where participants rode the newly expanded trail system to find various shaped hole punches located around the trail. Participants completing the task of finding all hole punches won prizes donated by Team MGR's sponsors. Team MGR Racing has been involved in motor sports since 2002. Team MGR Racing also does product reviews from time to time. If you have a product that you think is great and worth sending to us for an honest no nonsense review, check out the CONTACT page and lets talk about it. Check out Team MGR running the Bolder Boulder 10K road race! Keep an eye out you might see us on a trail near you! Join our Facebook group or check the Blog page to keep up with everything "The Junk Man" is up to. As always for video updates visit"The Junk Man's" Blip.tv show or "The Junk Man on Daily Motion"
Below are some pictures from the Grand Opening of the Harlan County Cedar Run trail system near the Harlan County Lake. Also pictures from other events the team has participated in.